We introduce the first natural spring-water cooler for Bag-in-Box. 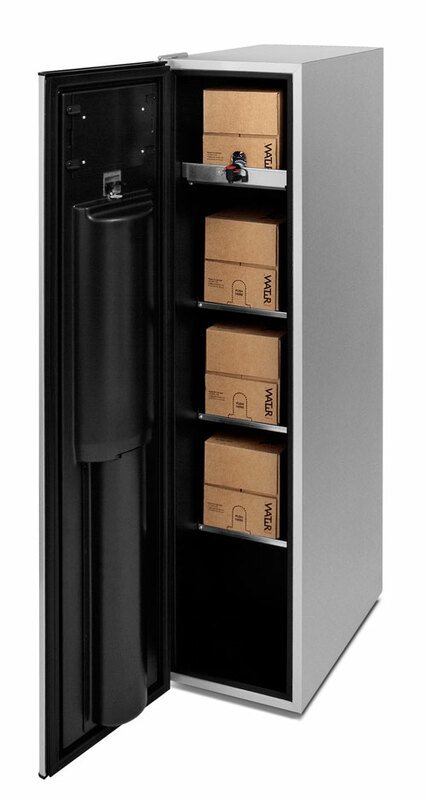 The cooler has a simple and 100% hygienic dispense system without any kind of tubes. The water is dispensed directly from the Bag-in-Box unit into the cup or bottle. The cooler has an ultra-low power consumption and is designed to be placed in offices, clinics, shops, cafés and other areas where both elegant design and storage is a requirement. It is the ideal choice for anyone who wishes daily access to fresh clean, natural spring-water. We can provide the water cooler customized in any color or print you want and the water cooler can be placed anywhere you wish, as it doesn’t depend on the water line. It is ideal for offices, in the reception, the clinic, the café or wherever you wish to have access to natural spring-water cooler. The environmentally friendly Bag-in-Box packaging is the future of packaging. The cartoon provides an effective barrier to direct sunlight and air, preventing the risk of bacteria and ensuring long shelf life. The bag-in-box solution is already widely known, e.g. from the sale of 3-litres wine, juice, etc. The package is 100% germ-free and less harmful for the environment than other packing solutions. The empty cardboard box is easily disposed of along with the rest of the household waste.